Fantastic 3 bedroom 3 bathroom home that has just been completely remodelled. The home has been beautifully furnished with top of the line furnishings, flat screen Tvs in all bedrooms and in the living room, granite countertops, comfortable superior mattresses and bedding and a beautiful pool backing onto conservation! 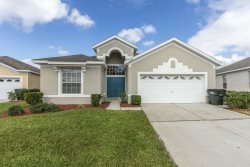 This home is located in a quiet gated community called The Reserve at Town Center. There is a brand new supermarket and restaurants just a couple of minutes from the home and Interstate 4 is less than a 5 minute drive away.